Great Q and A as always, really good stuff. Thanks Paul, great episode. I experiment with wild teas quite a bit and have never tried meadowsweet or spring bramble so am looking forward to those. I do use clover flowers (pink mostly) and love the sweetness, though I couldn’t drink too much of it!! Not sure of the health benefits but love to add some to other teas, especially nettle to make it more palatable! Hi Shirley, thanks for your message. Let me know what you think of meadowsweet and bramble. I agree, clover heads are very nice for making tea. Apparently, like many members of the pea family, they become a bit toxic later in the season though. I’m sorry that some people find time to give you such grief when all you’re trying to do is teach. As always, thanks for passing on such invaluble knowledge. Great video and very useful information passed on expertly as always, keep up the good work. and that would be the end of my Troll song. Thanks for your feedback on the episode and great to read about your efforts with the fire plough. It definitely is a challenging technique in the northern temperate climate and with the woods we have. Good effort though. 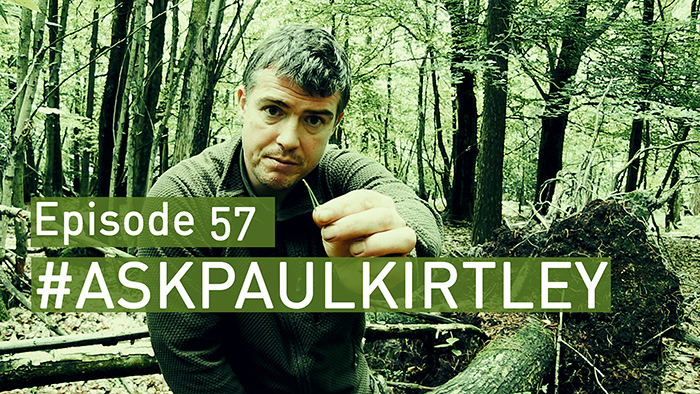 Excellent session of “Ask Paul Kirtley. Don’t worry about the few disrespectful hecklers or insults to your nationality. They mean nothing to the majority of your listeners-I hope the clown wasn’t my fellow American! Anyways to your listeners and students hello! If I may add wild strawberry leaves make an excellent flavored tea and if I am correct grow prolifically throughout northern forests? Hi Jim thanks for your kind words of support. Wild strawberry leaves do make a nice tea. Limey? Arrogant is one thing you definitely are not, but I did enjoy your glare into the camera when addressing the numpty who insulted you. The time and effort you put into your sessions is much appreciated; please keep it up.